AquaNerd and Aqua Illumination are doing a giveaway on an Aqua Illumination Prime LED fixture that will take place on April 1st. Anyone is eligible to win by liking this post on the AquaNerd Facebook page and liking AquaNerd on Facebook*. If you’ve already liked AquaNerd then all you will need to do is like the post. About the Aqua Illumination Prime LED Fixture. With a spread of 30″ x 30″, the AI Prime® has a peak PAR of 260µMol at a depth of 12 inches, more than enough for your hungriest of livestock. Drawing a maximum of 50 watts from the wall, it follows in the family’s efficient footsteps. The Prime LED fixture has three optional mounting options for mounting. The optional accessories are the Tank Mount, Single Hanging Kit and the new Flex Tank Mount Arm. This is probably one of the best features about the Prime; there’s no need to buy an additional controller. 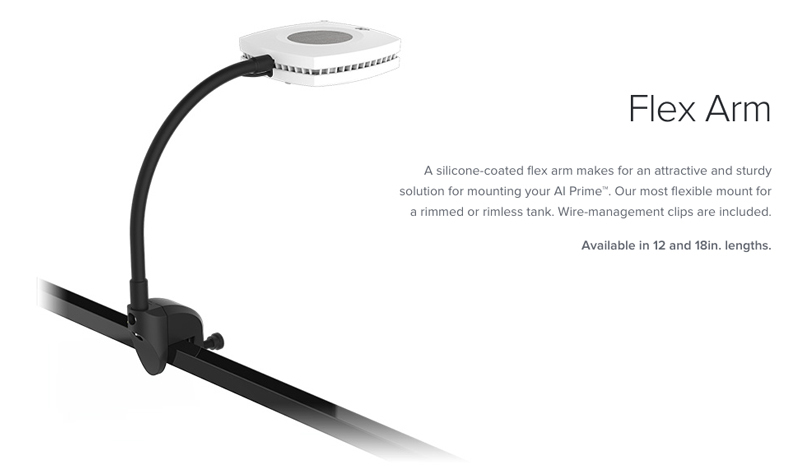 To use your light properly, the AI Prime® has control built-in. Just use your iOS, Android or internet-connected device to control the Prime, anywhere in the world! Each LED color can be controlled and programmed independently from the next. *Participants outside the US are responsible for paying duties and/or taxes.